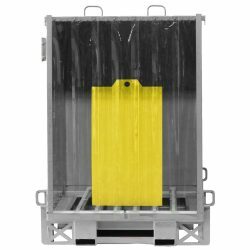 The Stainless Steel Mobile Wash Station creates a safe, EPA-compliant workspace for washing forklift batteries. The frame is constructed from 304/316 stainless steel for corrosion resistance and extreme durability. Inside, a battery bed of poly lead rollers and front-to-back friction strips simplifies loading and unloading. Fork pockets boost mobility, giving users the option to carry the unit to batteries. This limits downtime caused by the vital maintenance task of washing forklift batteries. Meanwhile,the MWS-47-SS collects all wastewater for proper disposal. Splash curtains help to contain overspray and runoff. The EPA considers wastewater generated by washing batteries to be hazardous waste, since it contains acid, particles of lead, and other pollutants. Mobile Wash Stations contain all of this wastewater for cleaning and reuse or other means of EPA-approved disposal. To learn more about which Mobile Wash Station is right for your application, call the BHS sales team at 1.800.BHS.9500.